For the problem of cleaning your wine and beer bottles, here at Home Brew Online we now have these great brushes which have revolutionised the cleaning process for the home brewer and wine maker for cleaning your bottles. 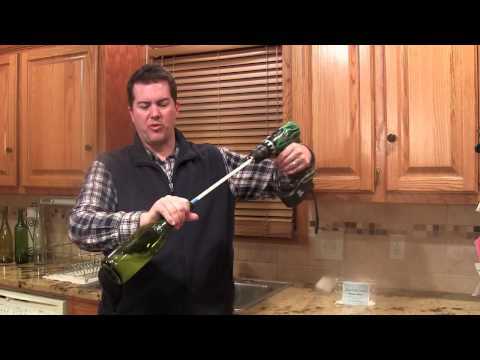 With Spiral Force Technology, the Bottle Brush will clean your wine and beer bottles in a fraction of the time it takes with the standard bristle brush. The product attaches to a standard cordless or power drill (not included) which provides any home brewer and wine maker an efficient and effortless cleaning process. Please note these can be a tight fit into some beer and wine bottles especially when new. 1. Tip the bottle on its side while cleaning with Bottle Cleaner to add extra water contact in the upper shoulder and neck area of the bottle to remove tough stains and grime. 2. Do a preliminary rinse of container prior to using the Bottle Cleaner to remove any large loose material. 3. Clean container with Bottle Cleaner for 30 seconds, let soap and suds sit for 5 minutes to soak, then finish for another 30 seconds. Showing 2 of our total 5 reviews, with an average rating of 4 stars. Read all 5 reviews for Clean Express - Bottle Brush Cleaner (Drill Attachment). Used with a rechargeable hand drill this is easy to use with 500ml PET or glass bottles. Once I'd got my technique sorted it was a breeze. I try not to let my bottles get filthy rinse then when they have been used. However the mechanical together with the chemical cleaning appeals to my OCD!